So, I pretty much knew I was head over heels in love with this book after the first chapter. I adore everything about it- the characters, the writing, the story. It's all perfect. My Life Next Door was just the book I needed right now. Adorable and utterly relatable, I instantly knew it would belong on my favorites shelf. It had been a while since I found a truly enjoyable piece of chick lit that wasn't shallow or cheesy. Fitzpatrick writes about so much more than the butterflies of first love, although those are present. Sam is juggling her choppy relationship with her mom, the drug addiction of a friend, and her best friend's insecurities when she meets Jase. I admired the author's entertaining and fresh outlook on the troubles of being a teenager. I knew that I was in for a wonderful read the moment Jase climbed Sam's trellis. I immediately loved them together. Their relationship is what romance should be, in my opinion. They are open and honest with each other. They don't hold back, and they respect each others' lifestyles, no matter how different they may be. Sam and Jase's chemistry is more than physical attraction- their personalities just click. However, I'm not going to lie. Jase is flipping amazing, which may have swayed my opinion on their chemistry a bit. The characters, like in many of my favorite novels, made the story for me. I got to know each and every one of them, and I related to their struggles. Now, judge me all you want, but I'm totally in love with yet another fictional character. I believe that my town has a shortage of Jase-like boys, and that issue needs to be addressed by immediately. 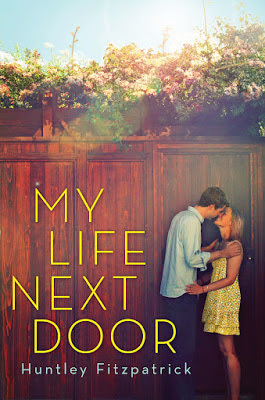 Overall, I was extremely impressed by the hilarity, depth, and romance of My Life Next Door. Huntley Fitzpatrick is an author I'm going to have to keep tabs on from now on! This is a heart. For this book. Because I love it. I really do.